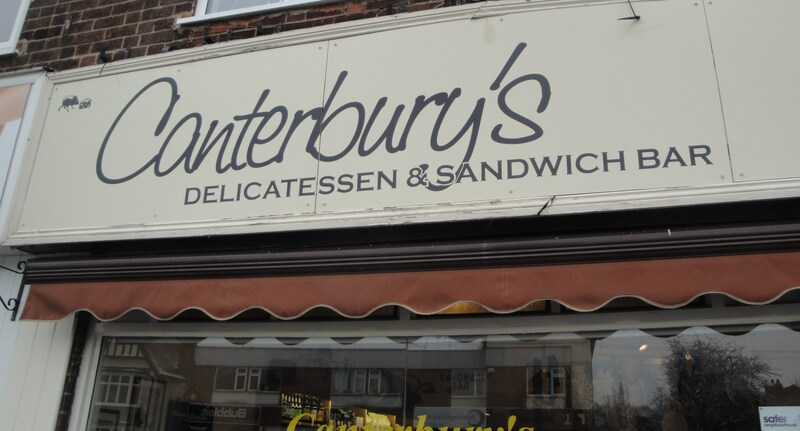 Canterbury’s Deli has two locations in Nottinghamshire, this one at 93a Melton Road in West Bridgford, and a second location at 4a Main Street in Keyworth. 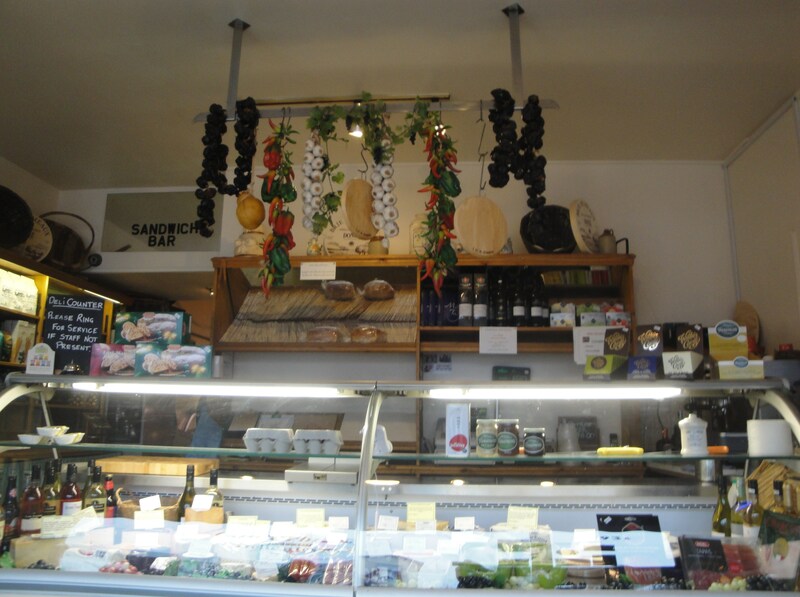 As you walk in there is a small seating area with just a couple of tables in the Deli section, they have a good selection of cheeses, and a well stocked shelf of artisan beers, then almost hidden towards the back is the sandwich counter. It is tucked back there but it’s well signposted and you probably will see the queue stretching back into the front deli area. There was quite a list of baguette fillings on the chalkboard and also you could see what ingredients were available in the cooler display. If you want a more extensive idea of what fillings they have on offer then check the menu out on their website. 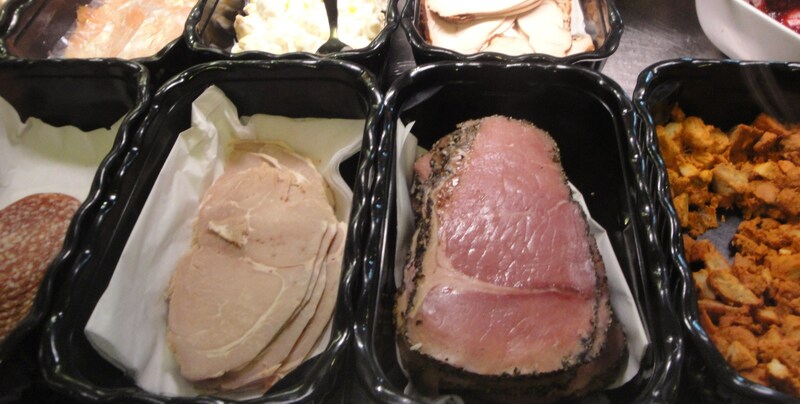 I was drawn straight away to some excellent looking pink pastrami sitting in the counter. There was no suggested combination on the board so I made my own combination up instead. I combined the pastrami with some mayo and rocket leaves, nice and simple. The pastrami was edged with a good crusting of cracked pepper and together with the peppery, crunchy rocket leaves it was a nice slightly spiced combination of flavours. The meat was moist and tender, nice and pink, the baguette was still warm and was quite delightful, a crunchy crust with a soft inside. The mayo almost melted into the bread as well making it even more juicy. 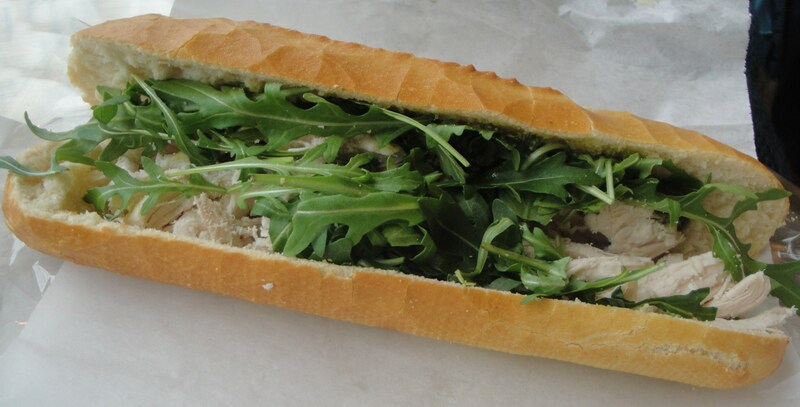 The second baguette that we got was the suggested board combination of “Chicken, Parmesan, Pesto, and Rocket” This was a well thought out combination, the baguette was stuffed with chicken and rocket leaves, I liked the freshly made pesto which was smeared across the top slice of bread. Again the bread was excellent as well. 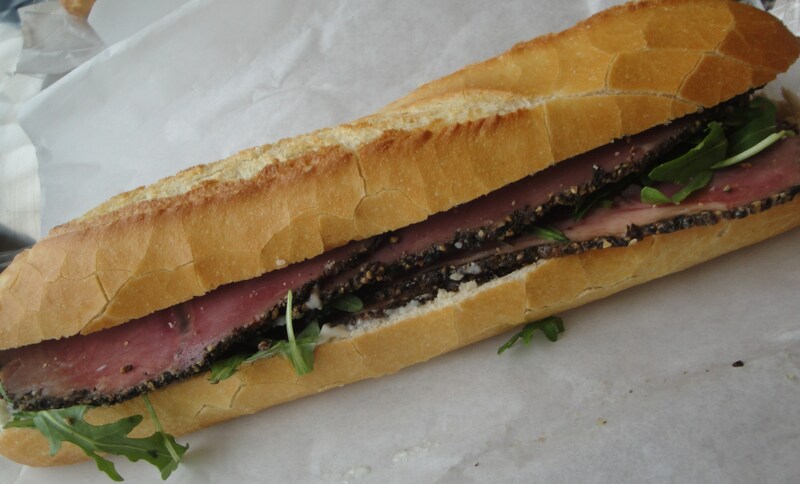 We did split both sandwiches and I thoroughly enjoyed both but my preference was for the pastrami baguette. I would come here again and try some of the other board options as well. There were “Smoked Ham & Jarlsberg” and “Mozzarella and Chorizo” combinations that I was quite keen on trying and a classic “Coronation Chicken with Mango Chutney” so plenty to choose from. It was pretty reasonable price wise too at just about £3.50 each (depending on how many fillings you added).